Hey, what timing! The Marvel NOW! Hawkeye comic just ended this week (a scant three months after All-New Hawkeye, its replacement series, started), and here we are reviewing Hawkeye in his NOW! costume. It's mainly black, with a purple shape on the chest. He comes with a fancy belt, big "wristguard" hands, and a utility harness that has his quiver attached to the back. The quiver actually holds the included three arrows, and he's got a black bow. Natasha Romanoff was a Soviet spy when she first met the Avengers, enlisting Hawkeye to help her defeat Iron Man. She would eventually defect, and use her keen combat skills as an Avenger herself. 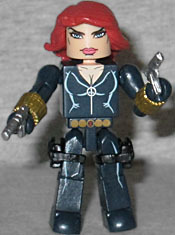 This is only the second comic-based Black Widow Minimate, and since the other one was in the height of 1970s fashion, a modern update is welcome. The major difference is that she's unzipped her catsuit to show off some cleavage. Seems unnecessary, but what are you gonna do? The important thing is that instead of a big beehive hairdo, she gets a more modern look. Also, a pair of guns, because the future is violent. 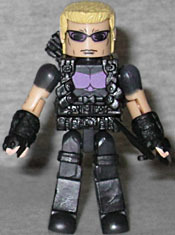 This entry was posted in Art Asylum, Marvel, MMMR and tagged Avengers, Black Widow, Hawkeye, Minimates. Bookmark the permalink.